George Mount began racing competitively in 1973 as a Junior category racer. In 1974 he began to win local Category 1 races and set records that stood for more than a decade Winning dozens of road and track event across the county he competed in the 1975 Pan American Team in Mexico City. In 1976 his performance in the Olympic Games in Montreal finishing 6th place set a new standard for modern American racing. A gold medal in Pan American games in 1979 he was widely considered a favorite for the 1980 games in Moscow. In 1977 he raced in Italy for a small Italian club, winning a number of major international races such as Bassano-Monte Grappa. In 1978 and 1979 racing for the US National team for most of the season in Europe and won many races, including the prestigious Tour Of Colorado, a stage of the professional Circuit de la Sarthe, Palio Del Recioto, and other major European races. In 1980 he turned Professional for an Italian team and continued to compete in Italy for 3 years, a major first for an American, and rare for any foreigner in Italy at the time. Finished 2 Tours of Italy in 20th and 25th places, and rode in most of the major classics in Europe. He competed in 5 World Championships on the road, and won national and district titles and medals on road and track. A Hall of Fame Inductee and active rider, George is well connected within the cycling community. During his cycling career, he won more than 200 races in the US, Europe, and South America. He now works for a high-tech company in the San Francisco Bay area. 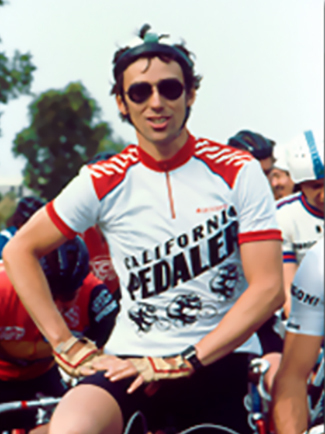 George has been actively supporting opportunities to assist the U.S. Bicycling Hall of Fame and has given Tireside Chat lectures at the Hall of Fame in Davis, CA.